Before we discuss mesonychids in cryptozoology, first we must define what mesonychids are. Simply put, they are a group of extinct ungulates that were predators. The ungulate group is one of the largest and most successful branches of mammals. Typified by hooves and sometimes by horns or antlers, today these creatures fill most of the existing niches for large herbivores all over the world. But, long ago, not all ungulates were herbivores. One branch of the ungulate family, called the mesonychids, were predators. These hoofed predators came in diverse forms, from tiny to horse-sized. There were hoofed counterparts to every kind of predator we have today. 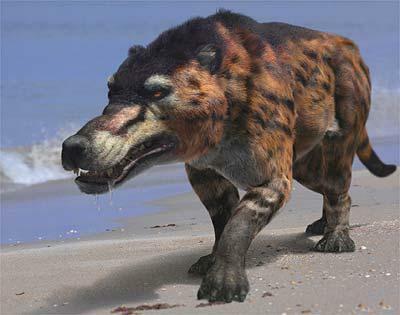 Some mesonychids resembled wolves, some resembled bears and some resembled cats, otters, hyenas or other modern predators. At this early point in time, hooves were still in an early stage of development, and all ungulates tended to have primitive hooves that looked as if they were in a form halfway between giant fingernails and the modern types of hooves that we are used to today. In addition, the evolutionary reduction of the number of hoofed digits and the differentation in the size of digits had not proceeded very far yet, so that ungulates were likely to have four or five toes of roughly equal size, each with its own proto-hoof. So what you might imagine when you try to picture "wolves with hooves" should be modified to include proto-hooves instead of exact replicas of the hooves that modern cattle, horses or deer have. The standard story scientists have been telling for a long time is that all hoofed predators became extinct, with one exception. One kind gradually became more tied to an aquatic lifestyle, producing land cetaceans such as the pakicetids and eventually evolving into the zeuglodon, a type of primitive whale that is thought to be the ancestor to all of today's whales and dolphins. Recently, some slight alterations to this standard story have been proposed. Scientists are beginning to think that perhaps mesonychids were not direct ancestors to today's whales and dolphins, rather that mesonychids were close relatives of the actual direct ancestors. One bit of evidence supporting this is the discovery that many of the earliest ungulates were omnivores or carnivores (like most whales and dolphins) with a changeover to fully herbivorous diets occuring rather late in the fossil record. In other words, the mesonychids were not the only ungulate predators, they were just the most famous group of ungulate predators. In the records of cryptozoology, there are indications that perhaps all land mesonychids did not become extinct. Things that sound like they might be hoofed predators are reported from places such as South America, where there is a beast called the tapire-iauara. The horned cats reported from islands near Java could be mesonychid predators. That region of the world is where many of the world's new animals are discovered, and islands are often known to preserve living fossils. In contrast to this, Europe is the last place we would expect to see a surviving mesonychid, but a strange hoofed predator was the object of an extended scare in France, this creature was dubbed the Beast of Gevaudan and was thought to be a strange sort of werewolf in local folklore. Mesonychids do not get much attention from cryptozoologists, but it is at least slightly possible that one or two species may have survived in some remote corner of a tropical rainforest. If any living mesonychids do still exist, they would be of great interest to scientists because studying them could throw much light on one of the largest and most successful groups of mammals - the ungulates. In addition, even if mesonychids are not whale ancestors, any possible discovery of a living mesonychid could still yield some clues about the land-bound ancestors of cetaceans. Luo, Zhexi. Evolution: In search of the whales' sisters. Walking With Prehistoric Beasts .